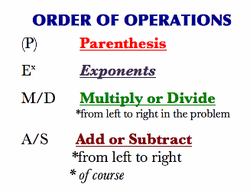 Order of Operations: The specific order in which you solve calculations. Inside the brackets, you apply the same rules. Order of operations example: Work through a challenging order of operations example with only positive numbers.